Why does the ITCZ shift and how? Annual-mean precipitation (colors) and surface winds (arrows). The precipitation data are from TRMM-TMPA for the years 1998– 2012, and the wind data are based on the ECMWF interim reanalysis for the same years. From Schneider et al. (2014). Most rain on Earth falls in the tropical rain belt known as the Intertropical Convergence Zone (ITCZ), which on average lies 6° north of the equator. Over the past 15 years, it has become clear that the ITCZ position can shift drastically in response to remote changes, for example, in Arctic ice cover. But current climate models have difficulties simulating the ITCZ accurately, often exhibiting two ITCZs north and south of the equator when in reality there is only one. What controls the sensitivity of the ITCZ to remote forcings? And how do the model biases in the ITCZ arise? Paleoclimate studies (e.g., Peterson et al. 2000, Haug et al. 2001) and a series of modeling studies starting with Vellinga and Wood (2002), Chiang and Bitz (2005) and Broccoli et al. (2006) have revealed one important driver of ITCZ shifts: differential heating or cooling of the hemispheres shifts the ITCZ toward the differentially warming hemisphere. So when the northern hemisphere warms, for example, because northern ice cover and with it the polar albedo are reduced, the ITCZ shifts northward. This can be rationalized as follows: When the atmosphere receives additional energy in the northern hemisphere, it attempts to rectify this imbalance by transporting energy across the equator from the north to the south. Most atmospheric energy transport near the equator is accomplished by the Hadley circulation, the mean tropical overturning circulation. The ITCZ lies at the foot of the ascending branch of the Hadley circulation, and the circulation transports energy in the direction of its upper branch, because energy (or, more precisely, moist static energy) usually increases with height in the atmosphere. Southward energy transport across the equator then requires an ITCZ north of the equator, so the upper branch of the Hadley circulation can cross the equator going from the north to the south. where we have substituted for the equatorial energy flux divergence from the energy balance above. The first­-order relation for shows that (1) the ITCZ position is farther south the stronger northward the atmospheric energy flux across the equator, and (2) the ITCZ is farther from the equator the weaker the net atmospheric energy input at the equator. Atmospheric meridional energy flux (red) and energy flux equator based on data from the ECMWF interim reanalysis for 1998-2012 (Trenberth and Fasullo 2012). The light red shading indicates an estimated 0.2 PW standard error (the actual uncertainty is poorly known). The blue line sketches a hypothetical scenario with strengthened cross-equatorial energy flux. From Schneider et al. (2014). The figure shows the atmospheric moist static energy flux in the zonal and annual mean in the present climate (red line). Given the equatorial values of the energy flux and of its ‘slope’ with latitude , the energy flux equator can be determined using the arguments from above. 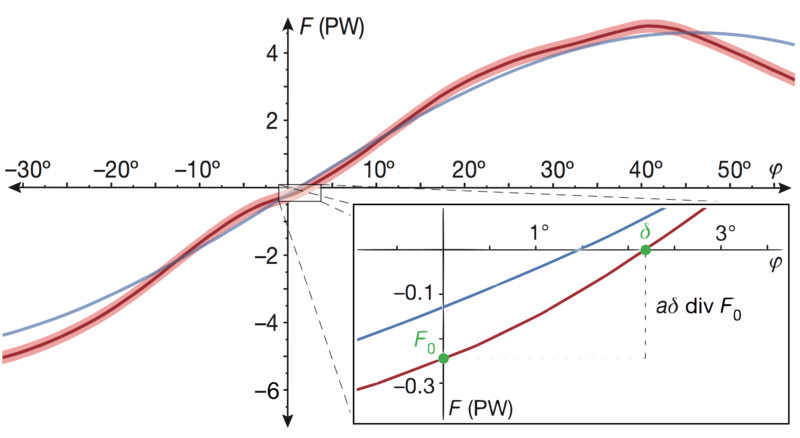 If the northward cross-equatorial energy flux strengthens (indicated schematically by the blue line), but the slope remains fixed, the energy flux equator moves southward. Similarly, if increases, the energy flux equator moves toward the equator. Several previous studies had pointed out that the ITCZ position is proportional to the cross-equatorial energy flux (e.g., Kang et al. 2008, Frierson and Hwang 2012, and Donohoe et al. 2013). That the net atmospheric energy input modulates the sensitivity of the ITCZ position to the cross-equatorial flux was pointed out in Bischoff and Schneider (2014). What are some implications of these insights from the energy balance? The analysis draws attention to the importance for the ITCZ of the atmospheric energy balance near the equator. The net atmospheric energy input near the equator is the small residual (~20 W m2) of large cancellations between absorbed shortwave radiation (~320 W m2), emitted longwave radiation (~250 W m2), and oceanic energy uptake (~ 50 W m2). Subtle shifts in any of these large terms can lead to relatively large changes in the net atmospheric energy input near the equator and hence large ITCZ shifts. Similarly, the cross-equatorial energy flux (~-0.2 PW) represents a small residual imbalance between the two hemispheres which each have, for example, shortwave radiative energy gains and longwave radiative energy losses of tens of PW. This makes the ITCZ a sensitive recorder of the atmospheric energy balance, and it likely accounts for the large swings in the ITCZ position inferred from paleoclimatic proxies (see Schneider et al. 2014 for a review). The results from the energy balance also point toward a way of understanding the double-ITCZ bias in climate models. The first-order expansion above breaks down when the net atmospheric energy input vanishes. In that case, one needs to go to higher order in latitude, and multiple solutions for the ITCZ position emerge. We will discuss this in a future post. A limitation of the insights from the energy balance is that they do not provide a closed mechanistic understanding of what controls the ITCZ position. Quantities such as the net atmospheric energy input and the cross-­equatorial energy flux depend on the strength of the Hadley circulation, among other factors, which in turn depends on the ITCZ position. How these are connected mechanistically (for example, through the angular momentum balance) remains a subject of ongoing research. I am not sure how to get an objective definition of what the ITCZ is. Most research articles have subjective definitions. Is it possible to get a objective definition of the ITCZ ? I am in India and we follow the monsoon trough during the Boreal summer. There are various ways of identifying the ITCZ objectively. For example, you can identify it as the rainfall maximum. To estimate robustly where the maximum is, you can calculate an expected value of the latitude using a high power of the precipitation distribution as the weighting function; gives the maximum, but gives a robust estimate in practice, which smooths over the discretization of the data. See Adam et al. (2016). You can also take it literally that the ITCZ is a convergence zone and determine the low-level convergence maximum. In the seasonal and longer-term mean, this gives essentially the same result as the rainfall maximum. I am a Ph.D. Student from India. I am working on Asian Monsoon. Can you tell me that how we plot the ITCZ through Software? The Intertropical Convergence Zone (ITCZ), is the area encircling the earth near the equator where the northeast and southeast trade winds come together. The ITCZ follows the sun in that the position varies seasonally. It moves north in the Northern Hemisphere summer and south in the Northern Hemisphere winter. Therefore, the ITCZ is responsible for the wet and dry seasons in the tropics. Hello, as an amateur observer (having difficulty to read the technical part of this article) I wonder if we are seeing the southern hemisphere jet streams spread out over a far wider area than before and particularly in Northerly direction (up to about 10 degrees South especially over the Pacific and Atlantic). Is the observation correct and if so, is this possibly correlated to the northerly shift of the ITCZ? If so, what are the likely consequences for the weather patterns in the Southern hemisphere? A trend in the Southern Hemisphere jet stream over a relatively short period is difficult to discern, among the background of large seasonal and year-to-year variability. The question of whether and how ITCZ shifts are related to jet shifts is interesting. They need not be related, but both can respond to changes in the energy budget. I am planning to write something on that in the next few months. I want to know whether itcz shift is greater in northern hemisphere or southern hemisphere? Anjay: The ITCZ is essentially the boundary between the northern and southern hemispheres of the earth. The equator is an idealized boundary; the ITCZ is a real physical boundary as defined by atmospheric conditions at any time. (The line at which northern trades (NE direction) and southern trade winds (from the SE roughly) converge. It is clearly visible, particularly over the oceans, in animations that show wind (and pressure). It tends to pass over the equator sometime roughly near the spring and fall, ideally, and would be maybe expected to spend equal amounts of time in northern and southern hemispheres. Is there a database that shows “exact” location ICTZ both not and south of the equator spacing it two weeks apart or on monthly basis? You can calculate that information, e.g., from TRMM data. The affirmation by Schneider et,al that only one ITCZ exists is not an accurate sentence. I live in Northtern Peru close to Equator border and every summer in mid February to March shows up a second branch of the ITCZ in the southern hemisphere, over the warmed ocean and when it,s very close to the continent may produce extreme episodes of rain till 100mm/day. Of course. We are well aware of the seasonal double ITCZ (and even wrote papers on how it may arise and why models exaggerate it).